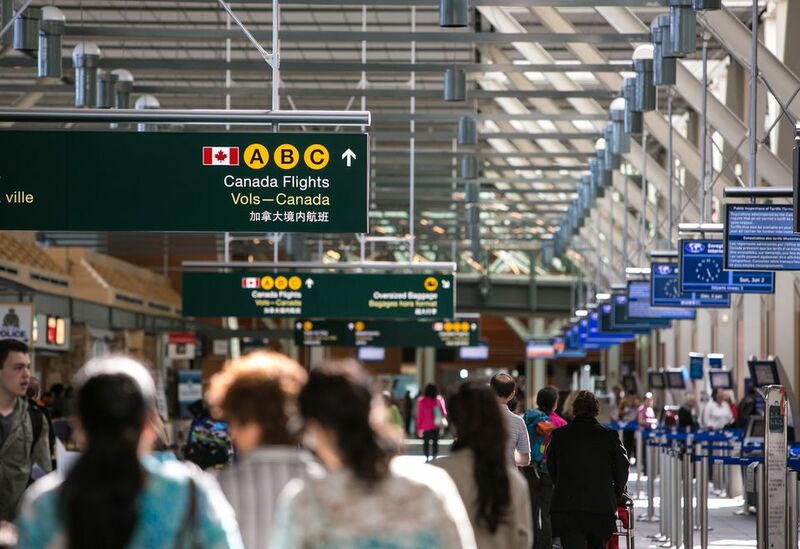 YVR (the code for Vancouver International Airport) is the second busiest airport in Canada, welcoming more than 24 million passengers in 2017, including arriving, departing, and connecting travelers. In such a bustling airport, having a plan to get to where you're going can save a lot of hassle. The Vancouver International Airport is located on Sea Island in Richmond, about 12 km (7.5 mi) from downtown Vancouver and about 30 minutes south (by car) from the city center. Served by its own SkyTrain rapid transit line, called the Canada Line, the airport is easy to reach via public transit or private transfers. Here’s a complete guide to everything you need to know about the airport. The Main Terminal is split into Domestic (Canada), International, and the US, with Airport South (South Terminal Building and Floatplane Facility), located a 15-minute shuttle ride away. More than 50 airlines fly to and from YVR’s Main Terminal, including national carriers such as Air Canada, British Airways, Air China, Air France, Air New Zealand, Icelandair, Qantas, and Philippine Airways. Budget Canadian airlines such as WestJet and Air Transat serve routes across North America and to places such as the UK. Luxury airlines include Cathay Pacific and there are many routes to Asia with airlines such as China Eastern, China Southern, Eva Airlines, and Hong Kong Airlines serving China and beyond. Airport South serves smaller airlines, float planes and helicopter operations including Helijet and Harbour Air with services to Tofino, Haida Gwaii, and the Gulf Islands. Relax with a massage at Absolute Spa before and after security in the US and Domestic Terminals, or in the Air Canada Maple Leaf Lounges that can be found in International, Domestic and US Terminals. Other services include shoe shine, shoe repair and clothes cleaning facilities, as well as baggage storage and a Canada Post outlet to mail any last-minute postcards. Shopping opportunities range from 711 and Hudsons News outlets to designer brands such as Cartier, Bulgari, Burberry, and Gucci. Pick up local chocolates from Rogers’ (after security in Domestic) or visit iStore for travel gadgets. Make a night of it and stay at the Fairmont Vancouver Airport, a soundproofed luxury hotel and spa that is situated in the US section of Main Terminal - perfect for an early morning flight or a late night arrival. There are various places to eat and drink before and after security in the Main Terminal - Food on the Fly allows you to take restaurant meals and snacks onto the flight. Fast food options such as Burger King, A & W, Starbucks, Subway, Wendy’s, White Spot, and Tim Hortons can be found on both sides of security. For a taste of local food, try Stanley Park Taphouse in the Domestic Terminal after security, Pajo’s Fish & Chips before security in the International Terminal before security or Canucks Bar & Grill after security in the US terminal. For a special treat, visit Globe @YVR inside the Fairmont Vancouver Airport for a romantic meal of local West Coast cuisine before take off. The Flying Beaver Bar & Grill at Airport South, near the Floatplane Facility, is a local institution that’s well worth a visit if you’re traveling from here. Hourly, daily, weekly parking options are available next to Main Terminal at Gateway Valet or the Parkade, with other slightly cheaper options such as jetSet Parking and Value Long Term Parking just a short shuttle ride away. Parking is also available at Airport South and free electric vehicle charging stations can be found at all parking lots. Main Terminal has onsite car rental through National, Alamo, Hertz, Dollar Thrifty, Avis, and Budget (as well as members-only Zipcar). Off-site rentals (a 10-15 minute shuttle ride away from the Courtesy Shuttle Zone) include Enterprise Rent-a-Car, Discount Car and Truck Rentals, Routes Car Rental, and local car shares Car2Go and Evo CarShare. Getting to or from the Vancouver International Airport (YVR) from downtown Vancouver is about a 20-minute car ride and not much more by public transport thanks to the Canada Line, a monorail-type train that is part of Vancouver's efficient and reasonably priced public transportation system. You can conveniently access trains from both the International and Domestic Terminals and get to various locations in and around Vancouver. Vancouver is a progressive town with a commitment to sustainable living - maybe more so than anywhere else in Canada and its commitment to excellent public transport is part of its green charm. Nevertheless, if private transport is more your speed, lots of other options are available from downtown. Public transit: The Canada Line has made getting to and from the Vancouver International Airport by public transportation easy and affordable. This rapid rail service connects Metro Vancouver's busiest north-south corridor, linking downtown to Richmond and Vancouver International Airport. As of 2018, an adult fare from YVR to downtown Vancouver is about Cdn $7 to $10 depending on the time of day and age of the traveler. Access to the Canada Line is from within the airport terminal. Taxis: Taxis servicing the Vancouver International Airport follow a set-rate fare zone system for reliable pricing. A taxi ride from the airport to central Vancouver takes about 30 mins and costs Cdn $26 (as of 2018). Set fares to other Vancouver locales range between $20 and $41. A $3 to $10 tip on top of this is standard. Taxi fares to the airport are based on the meter and from downtown Vancouver, including from the cruise ship terminal, are about $35. Courtesy shuttle: The Vancouver International Airport offers complimentary transit between the airport and many local hotels. The courtesy shuttle services numerous Richmond hotels but as of 2017, only one downtown Vancouver hotel.